This will be a short post. I'm relaxing in the David Motel Lodge outside Ellsworth, WI. It has been raining off and on for days, but today the sky began to clear. The sun came out in the afternoon and the temperature hit 88 degrees. I made good time, and expect to get to Minneapolis tomorrow. You might enjoy checking out my road cycling activity on Garmin Connect. However, I had to reroute myself several times because the Chippewa River bike trail has been washed out in many places. Looking west at an underpass on the Chippewa Falls Bike Trail. Looking east at an underpass on the Chippewa Falls Bike Trail. Looking west away from the underpass. 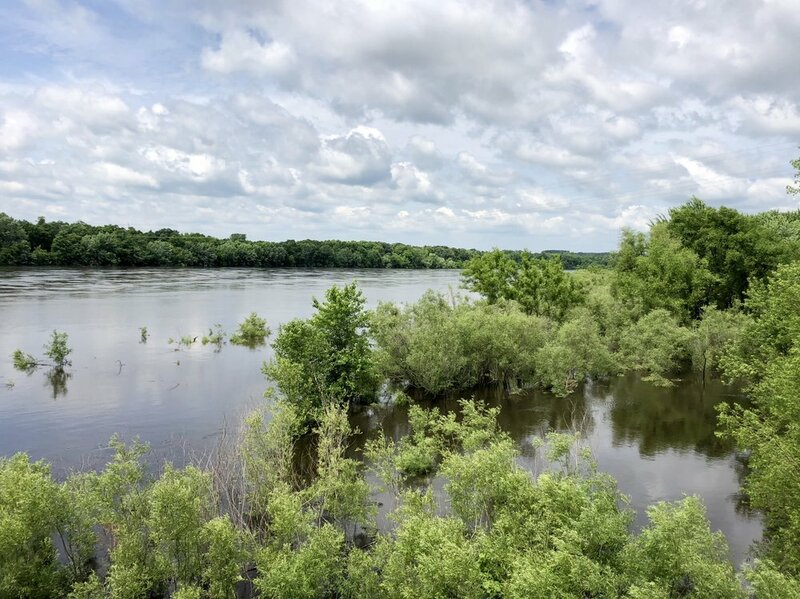 Another shot of the swollen Chippewa River. A local gricery store manager told me that 15 inches of rain fell on Saturday night in Durand, WI, so I checked it out. He was right. Four days later Durand is still flooded by the swollen Chippewa River.